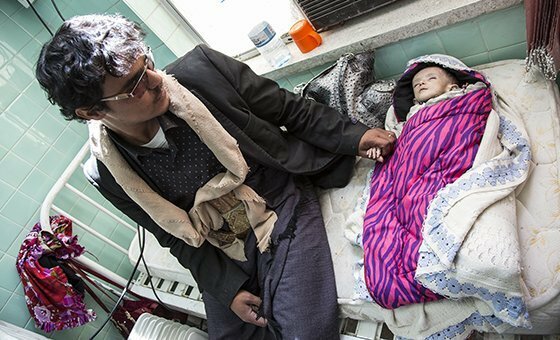 A child suffering from severe acute malnutrition being treated at the Al Sabeen maternal hospital in Sana'a, Yemen. 11 November 2018. UN humanitarian agency the World Food Programme (WFP) has appealed for access to a key storage facility in the port of Hudaydah, which is now under the control of a Saudi-led military coalition that supports the internationally recognized Government. The development comes amid fierce fighting between Government forces and Houthi opposition militia in and around the key Red Sea port, which processes around 70 per cent of the war-torn country’s deliveries of aid and commercial supplies. “Despite having been targeted by more than 50 shells in the recent days, the silos of the Red Sea facilities are more or less intact,” WFP spokesperson Herve Verhoosel said. Speaking to journalists in Geneva, Mr Verhoosel confirmed that staff have not have access to the silos for two months because of a spike in violence “from both parties”. On Monday, the port entrance was reportedly targeted by airstrikes, part of a renewed bid to launched at the beginning of the month to wrest Hudaydah city from the Houthi rebel movement fighters, who also control Sana’a, the country’s capital. “We have apparently not lost any of our stock of more than 51,000 tonnes of wheat – enough to feed more than 3.7 million people in Northern and Central Yemen for one month,” Mr Verhoosel explained. The violence is part of an offensive launched on Hudaydah in June by coalition forces, which have provided military assistance to Yemen’s President Abdrabbuh Mansur Hadi, since March 2015. Efforts to bring the warring parties to the negotiating table have so far proved elusive, and UN Secretary-General António Guterres on Monday described the potential humanitarian impact of the impasse as “absolutely disastrous”. “I think there’s a consensus, the US, Russia and Europe, and among many countries in the region that now it is the moment to stop this war,” Mr. Guterres told French national radio, before adding that he hoped those directly involved in the fighting understood this. In a statement on Tuesday, UN humanitarian affairs chief, and Emergency Relief Coordinator, Mark Lowcock, said that 'all parties must live up to their obligations under international humanitarian law. I ask that the parties implement a cessation of hostilities, not least in and around all the infrastructure and facilities on which the aid operation and commercial importers rely." Hudaydah port is critical to the humanitarian effort in Yemen, UN agencies insist, because it is a primary gateway for food, fuel and medicine into the impoverished country, which imports nearly all its daily needs. In a bid to assess the situation personally, WFP Executive Director David Beasley arrived in Yemen on Monday, as the agency plans to scale up aid to up to 14 million people in Yemen - well over the eight million Yemenis who are close to famine and who receive food or food vouchers from WFP every month. Of that number, 1.8 million are children under five years old who are described as acutely malnourished; another 400,000 are severely acutely malnourished, and yet another 1.1 million are malnourished pregnant or nursing women.